Rebuilt to factory new condition with all metal parts replated in Cad yellow finish. Rebuilding consists of New: Throttle shafts & bushings, Throttle discs, nozzels are rebuilt with new jet tubes, upgraded nozzel to float bowl fuel hoses with upgraded hose clamps, meetering needles, floats, float valves & pivot pins, air piston return springs & all seals & gaskets. Carbs are bench tested for leaks & equal air/fuel flow and are ready to bolt-on & run with minor tuning i.e Idle speed & mixture. Paltech also offers full rebuilding, restoration & bench testing service of the Datsun 240Z, 260Z, 510, 1500, 1600 & 2000 ect SU Hitachi carbs, linkages & intake manifolds. 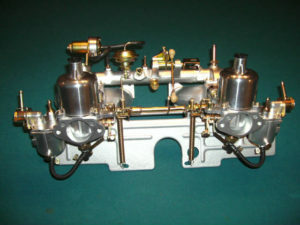 We also offer complete carb, intake & linkage setups as well as a 240Z & 260Z flat top carb & 280Z fuel injection to the 240Z model SU carb converson. See links at the very bottom of the page. 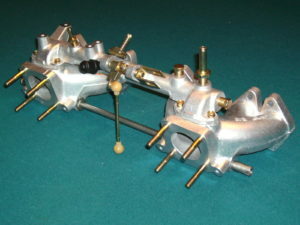 Carbs are fully disassembled, all metal parts are cleaned then replated correct cadminum yellow. 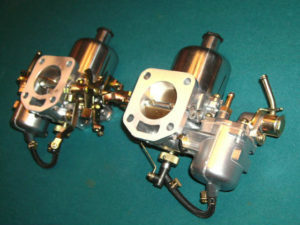 The carb bodies, float bowls, suction chambers & air pistons are Micro-polished (inside & out) to bring back the original type or better finish. The Micro-polishing also refinishes the slides which is the most important process of the rebuilding. 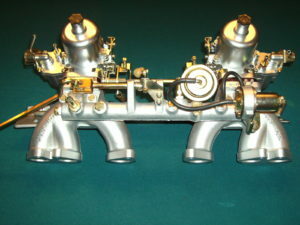 Carbs are then bench tested on a carb flow bench for leaks & equal air/fuel flow to each other. Air/Fuel delivery is determined by the measure of fuel consumption at a constant air volume flow. Warranty: Full One Year with free technical help for the installation & tuning. Intake has all of the plugs, fitings, studs, brackets & linkage ect. are removed. Intake then gets untrasonically cleaned inside & out. Intake then goes into the Micro-polisher & is Micro-polished inside & out. All plugs, fittings, studs, brackets & studs ect are correctly yellow cad plated & installed. Note hot water pipe & fittings are left intact and refinished in silver.